How to use your history to help promote your business . . . When you’re struggling to find new ways to promote your business, it sometimes pays to let history be your guide. The 125-year-old Hotel Colorado in Glenwood Springs offers a good example of how your past can provide powerful inspiration. When we started working with the hotel more than a decade ago, we quickly began brainstorming about events that could celebrate Hotel Colorado’s rich history, while providing guests a new reason to visit. 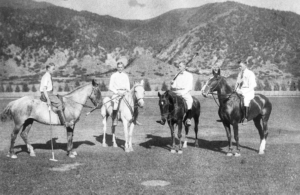 After a little research, we discovered that Glenwood was one of the first places in the United States to experience the sport of polo, thanks to Hotel Colorado’s founders, Walter Devereux and Harvey Lyle. The pair were championship polo players and formed the Glenwood Polo and Racing Association. When the hotel was completed in 1893, Devereux and Lyle included polo grounds on-site for the use of the guests and staged the area’s first polo match as part of the opening celebration. Polo eventually gave way to other more popular pastimes in Glenwood, but we thought it might be worth resurrecting the sport to attract polo fans from near and far. So, we helped the Hotel Colorado re-launch the Devereux Cup and promoted the event every summer for several years. 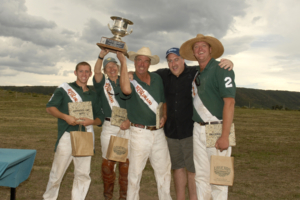 The tournament was held at Stout Ranch at Baldy Creek, owned by Hotel Colorado’s polo team captain, Barry Stout. 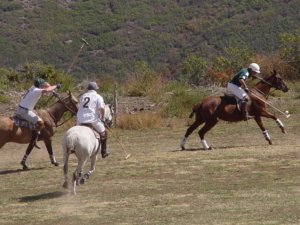 At 8,000 feet, the site has the distinction of serving as one of the highest points where polo has been played. Click here to read this colorful article from the Glenwood Springs Post-Independent about the first Devereux Cup tournament at Stout Ranch. In addition to non-stop action, the Devereux Cup also featured a meet-the-players gala and an awards banquet, both hosted by Hotel Colorado. We developed and marketed a special polo tournament package for visitors to capitalize on all the activities available. Our efforts to promote the event elevated Hotel Colorado’s profile in many local and regional publications and garnered attention in polo industry media outlets as well. Celebrating Hotel Colorado’s history allowed us to create a new attraction for the hotel that drew interest from locals because of its novelty, while also offering polo aficionados another opportunity to support their sport. And because Hotel Colorado was once a polo hub, a revival of the sport made perfect sense. We’re convinced that every business owner should consider mining their heritage for promotional ideas. Even if you’re a relatively new operation, the town or city where you’re based might offer historical nuggets worth exploring. Our experience shows that taking a walk down memory lane is worth the trip. https://www.staskoagency.com/wp-content/uploads/2018/10/10008856adj_1mb.jpg 1218 2100 Stasko Agency https://www.staskoagency.com/wp-content/uploads/2018/03/stasko-logo-dark-sm.png Stasko Agency2018-10-11 16:14:372018-10-11 16:16:56How to use your history to help promote your business . . .